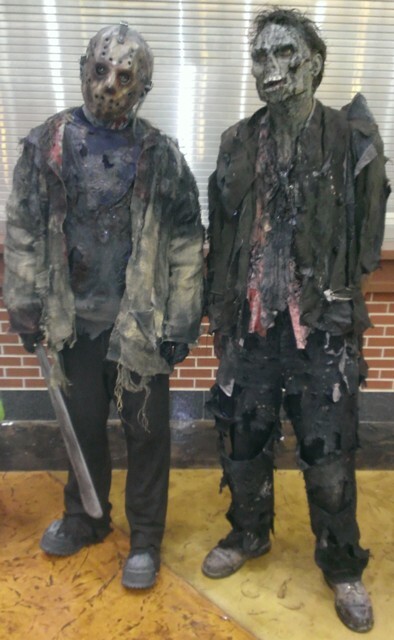 ScareFest brought the spookiness and the screams to Lexington, KY, in 2013. The thirty days around Halloween are always a hectic time for me, but I try to attend as many live events and conventions during this timeframe as possible. 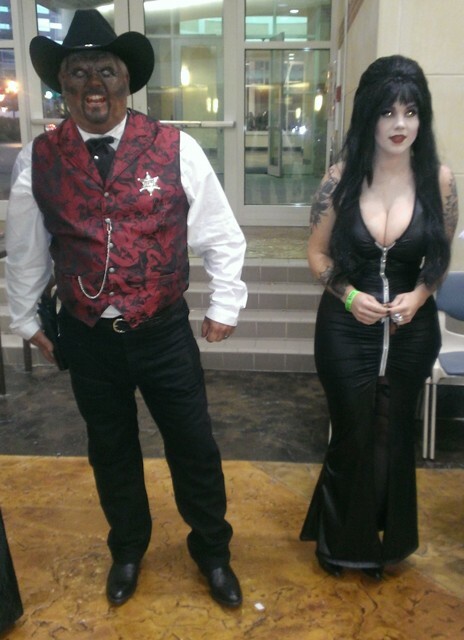 One such event was ScareFest, the horror and paranormal convention that took place in Lexington, KY. For the second year in a row, I’ve attended this great convention, which continually surprises me with great guests and entertainment. At the Opening Ceremony, I attended the Black Carpet gala, where all the celebrity guests pose for photo-ops for the press and answer a few quick questions. Many celebrities were present, but the highlight was the Syfy Family Photo Bomb! After Ghost Hunters Grant Wilson, Steve Gonsalves and Dave Tango soaked up the spotlight, followed by Haunted Collector John Zaffis and Destination Truth host, Josh Gates, it was time for the gang from Deep South Paranormal to make their appearance. As these Bama Boys were getting ready, the rest of the Syfy Channel celebs returned and photo bombed them. It was pretty funny. I spent the majority of Friday night walking throughout the enormous Vendors Room, which had to be double the size from the previous year. I meandered around, stopping to chat with various people, including getting great interviews with Bishop James Long and Cosplayer Kimberly Dunaway. I took tons of photos of cosplayers. There were some really great costumed characters wandering about the entire weekend. I didn’t attend any haunted houses this year. It’s too bad, because I had so much fun attending them last year. Unfortunately, I had a tighter timeframe to cram everything in, so I couldn’t help it. Saturday was spent doing nothing but attending panels from 11:30 am to 7:30 pm. That’s eight hours straight! I was totally worn out, but had a blast! Up first was Josh Gates’ Destination Truth panel. I make a point to attend every panel of Gates, because they’re so fun and informative. Having previously attended his panels at Dragon Con and the previous year’s ScareFest, he’s always a big draw and always worth it. I later got a quick interview with Mr. Gates. Up next was Malcolm McDowell’s panel. The world-renowned actor made his ScareFest debut a little later than planned… but better late than never. Last year, he was lined up to attend and promote the 41st year anniversary of A Clockwork Orange, and at the last minute, he had emergency eye surgery. I was thankful he was all healed up, but unfortunately, he wasn’t in the greatest of moods for his panel. Acting incredibly smarmy, he answered only a few questions by the fans, discussed his admiration for Director Stanley Kubrick, his disdain for CGI, then abruptly ended his panel half-way through the session (more than 30 minutes early), when his watch-alarm proudly rang. He mentioned it was time for his beloved soccer team to play on TV, so he was closing up shop. Not a good way to win over fans who’ve been wanting to see you for more than two years, Mr. McDowell! For the second year in a row, I was pleased to visit with psychic Chip Coffey. I attended his gallery reading for the second year in a row and surprisingly received a special message from my passed-over Grandfather, whom I dearly miss. If you ever get a chance to visit or attend any of Chip’s gallery readings, it is totally worth it. I fully recommend it. The next panel I attended was also the most popular of the entire weekend. Bishop James Long discussed demonology and possession, but beforehand, he had spectators spilling out of the tiny room where he was originally placed. His panel was briefly delayed while it was moved into the largest auditorium in the entire convention center. And let me tell you, his panel was great. He discussed performing exorcisms, creating the Paranormal Clergy and appearing on the TV show, Ghost Adventures. He had so much evidence in the form of photos, videos and sound clips, I only wish his panel could’ve lasted longer. 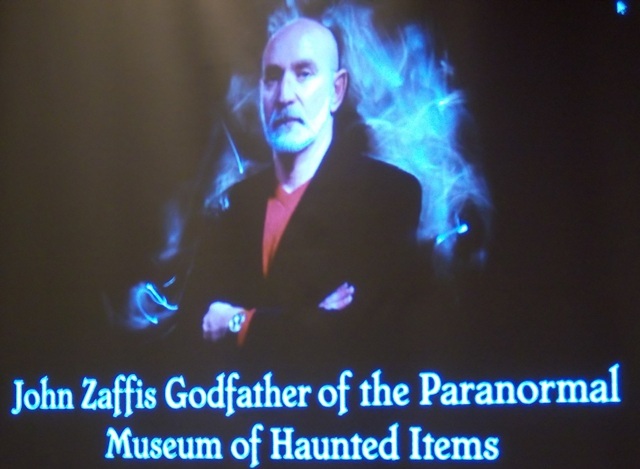 Haunted Collector John Zaffis had the next panel, but his was more like a video biography. It detailed his past work, creating his TV show on the Syfy Channel and dealing with items that may be legitimately haunted. I had tons of questions for him, but unfortunately, his time was up. The final panel of the evening was the most intriguing: Alien Abductee Travis Walton discussed his life story as loosely chronicled in the feature film, Fire in the Sky. I had no idea he had so much drama fighting a couple of loud-mouthed UFO skeptics (including Phillip J. Klass) throughout the years via the press. In the brief amount of time we had, he did his best to lay out all the facts of the event and the follow-up controversy surrounding it. 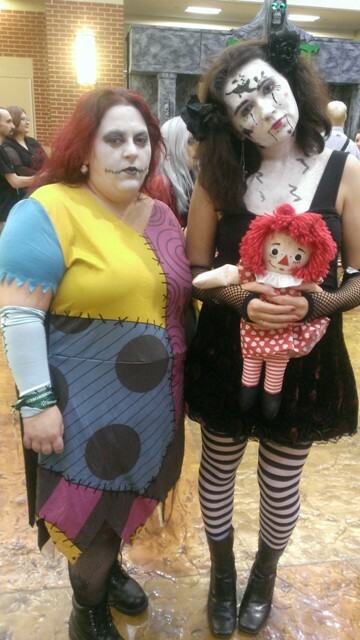 The ScareFest Costume Contest followed. There were a lot of great cosplayers roaming about the convention center. It was even busier than the previous year, with UK playing football just down the road. Many great costumed characters could be found. After the contest, there were a handful of bands that performed. I was worn out, so I grabbed a bite of food, followed with a couple of drinks before passing out. Sunday was spent getting some great interviews. 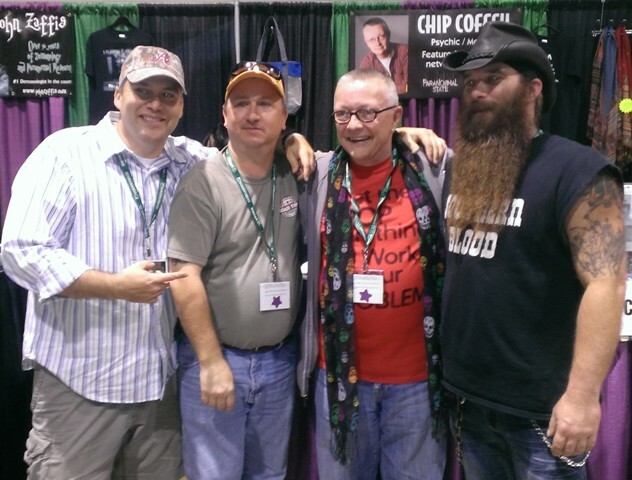 After attending their panel, I finally caught up with the Bama Boys of Deep South Paranormal and got a quick interview with them. This was the second time within a month I got to visit with them ( Pensacola Para Con was the other time). They’re all-around great guys. I truly hope their TV show gets picked up for a second season. Interviews with Aaron Goodwin of Ghost Adventures and Alien Abductee Travis Walton followed. Later that day, I spoke with Paranormal Investigator and Co-Creator of ScareFest Patti Starr and got her to sign my copy of her book, Ghosthunting Kentucky. She paused for a few minutes to also give me a quick interview about the book. Throughout the weekend, there were other events happening, including various movie screenings and a late-night ghost hunt of The Kentucky Theater, both of which I missed. Sadly, I couldn’t do everything! I had a blast during the entire convention and hope to return next year for my third year in a row!